The United Nations on Saturday renewed its support for the Iraqi government's plans and program that focuses on stability, reconstruction, reconciliation and development of services. "The Prime Minister Adel Abdul Mahdi in his official office this morning, received the Special Representative of the Secretary-General of the United Nations to help Iraq, Jinin Hines Blaschart," the media office of the Prime Minister said. The Prime Minister expressed his appreciation for the "humanitarian role played by the UN Mission in Iraq and its support for the government's efforts to establish peaceful coexistence among Iraqis, establish security and stability throughout Iraq's provinces and return displaced people to their homes." In its tasks. " 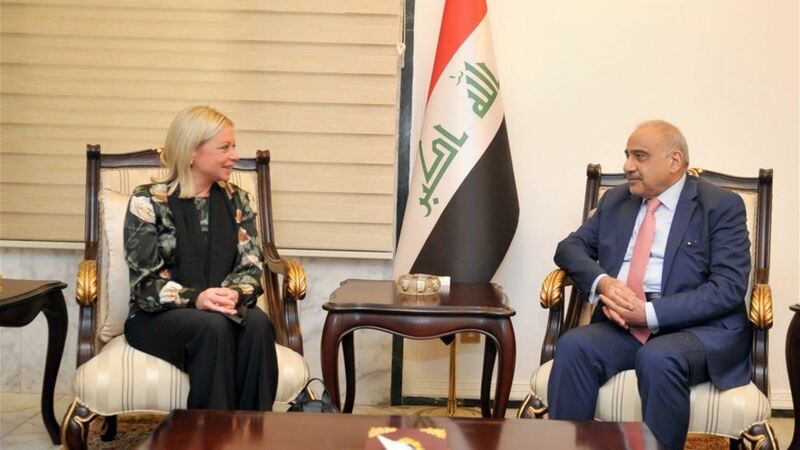 For her part, the representative of the Secretary-General "
She expressed "satisfaction with the situation of stability in Iraq and its thanks for the cooperation and facilities provided by the government to the mission of the international organization." The statement said that "the representative of the United Nations reported on its visit to the Kurdistan region and a number of areas during the first month to assume its mission in Iraq." The Electoral Commission on Saturday discussed with the representative of the UN Secretary-General in the new Iraq the electoral process and how to strengthen it. "The representative of the UN Secretary-General and the head of the UN Assistance Mission for Iraq (UNAMI), Jenin Hines Blaschart and her delegation, visited the headquarters of the Independent Electoral Commission today, and met with the President and members of the Board of Commissioners" . He added that "members of the Board of Commissioners talked during the meeting about the functions of the work of the Commission as a constitutional institution manages and regulates the electoral processes in Iraq, one of the pillars of the important process of democracy. The members of the Council, according to the statement, "the important preparations by the Commission to implement the upcoming electoral benefits after providing the requirements for success, especially the provision of financial budget for the elections and the final amendments to the law on provincial elections." They praised the role of the United Nations through the presence of its Advisory Group in working with UNHCR and its support in international expertise that contribute to greater transparency and integrity in its work. For her part, Blachkart stressed "the role played by the United Nations Mission and its assistance to Iraq in progress in the field of democracy and good governance." And expressed its "full support to the Electoral Commission in its efforts to complete its procedures, especially with regard to the upcoming provincial council elections." She called on "the partners of the electoral process to increase the frequency of communication and interest by urging citizens and voters to participate and support the Commission to operate in a manner that contributes to the success of electoral benefits." "The mission of the United Nations and its team to continue to support the work of the Commission through the provision of the necessary expertise and the creation of an appropriate atmosphere and invest the energies that it possesses and the organization of courses and workshops to develop the capabilities of its staff to serve the upcoming electoral process." The Board of Commissioners continues to meet with international and local missions and organizations and officials in the State and organizations and personalities active in the election in preparation for the upcoming local elections. expressed Prime Minister Adel Abdul - Mahdi, Saturday, appreciated the humanitarian role played by the United Nations Mission in Iraq, while the Special Representative of the Secretary General of the United Nations to help Iraq Genin Hennes Blaschart confirmed the United Nations to support the Iraqi government and support its plans and program. The media office of Abdul-Mahdi said in a statement read by Alsumaria News that "Prime Minister Adel Abdul-Mahdi received today morning, the official library of the Special Representative of the Secretary-General of the United Nations to help Iraq, Jinin Hines Balashkart," noting, "Abdul Mahdi expressed hope that the UN mission The United States in its tasks in Iraq. " "He expressed his appreciation for the humanitarian role played by the mission and its support for the government's efforts to establish peaceful coexistence among Iraqis and to extend security and stability throughout the provinces of Iraq and return the displaced to their homes." For his part, the representative of the Secretary-General Jinin Hines Blaschart, "support the Iraqi government and support its plans and program, which focuses on stability and reconstruction, reconciliation and development of services," pointing out that "Iraq is clearly evident." And expressed its satisfaction with "the state of stability in Iraq and its thanks for the cooperation and facilities provided by the government to the mission of the international organization." 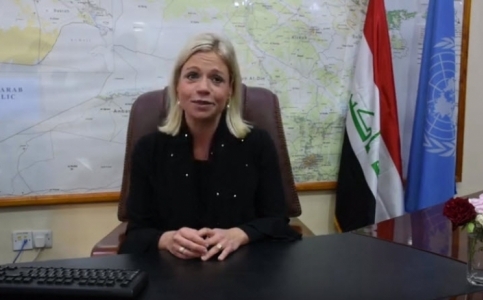 Blachkart reported on her visit to the Kurdistan region and a number of areas during the first month to assume her mission in Iraq.